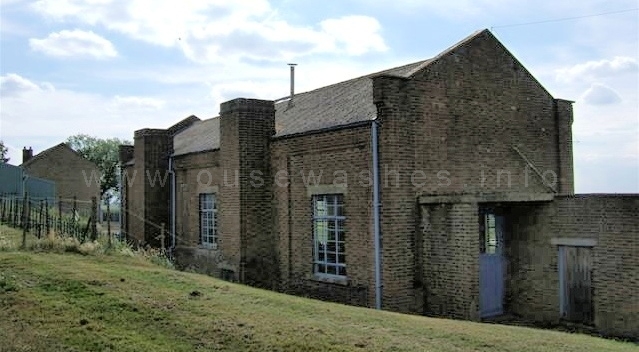 This pumping station is 2¾ miles south-west of Welney (but actually in the parish of Manea) on the west bank of the Old Bedford River (OBR), part of the the Counterdrain/Old Bedford River (CD/OBR), which in turn is a section of the Cranbrook Drain/ Counterdrain/ Old Bedford River system (also CD/OBR). 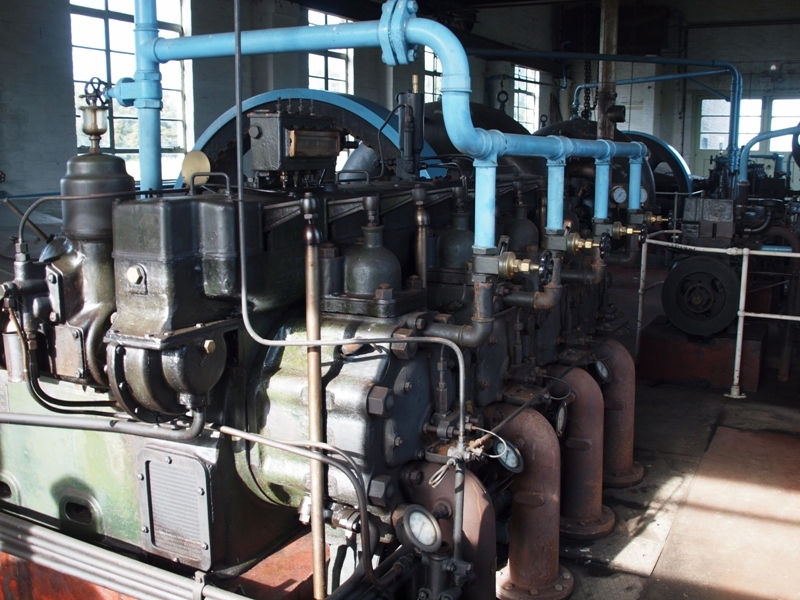 The first pump here was wind driven, replaced by steam in 1842 and since the 1920s by various diesel-powered plants. 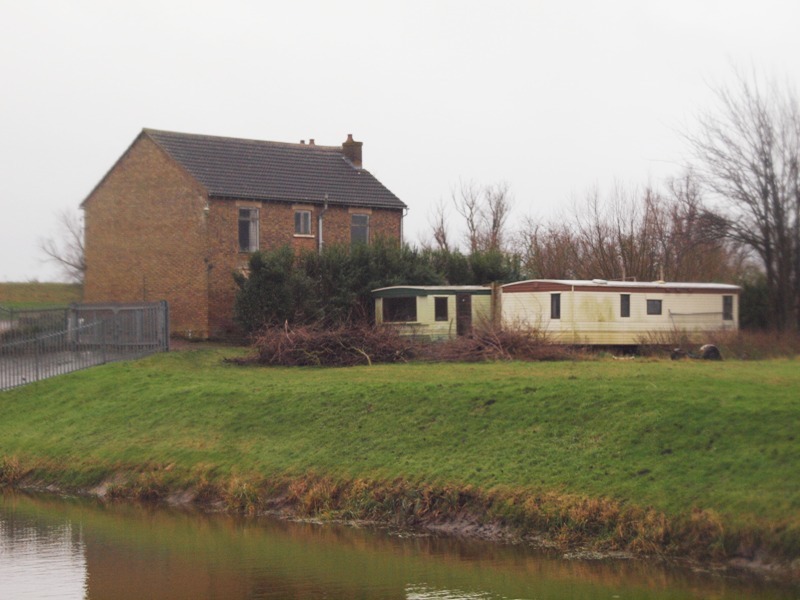 The photo (taken on a wet dull January day) shows the pool at the end of the Commissioner's drain and the the rear (intake side) of two diesel-powered stations; the brick one on the left, no longer used; and the current station (all the blue bits). Extreme right was once the manager's house, but now privately owned. 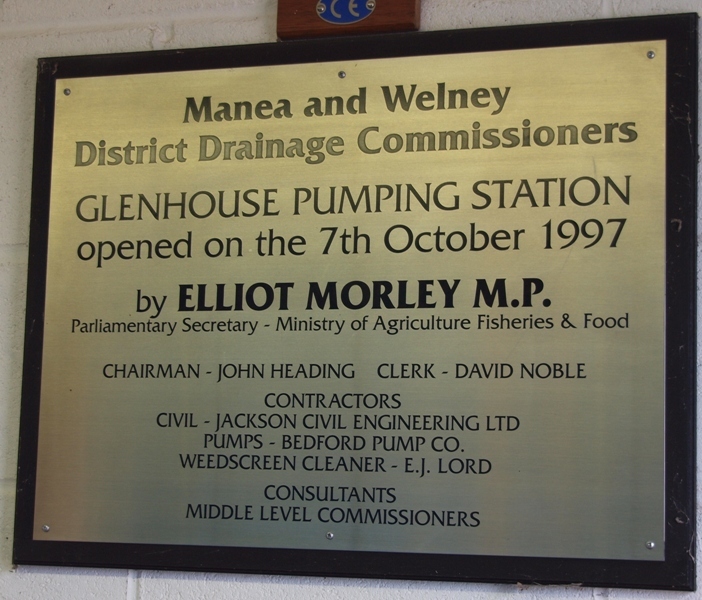 The station is one of two owned by the "Manea and Welney District Drainage Commissioners" (M&WDDC) who were first established in the late 1750s. The other is a much smaller one at Purles Bridge to the south. The Commissioner's map of 2011 shows another near Welches Dam, but that appears to have been derelict for many years and is not shown or referred to in their other documents. 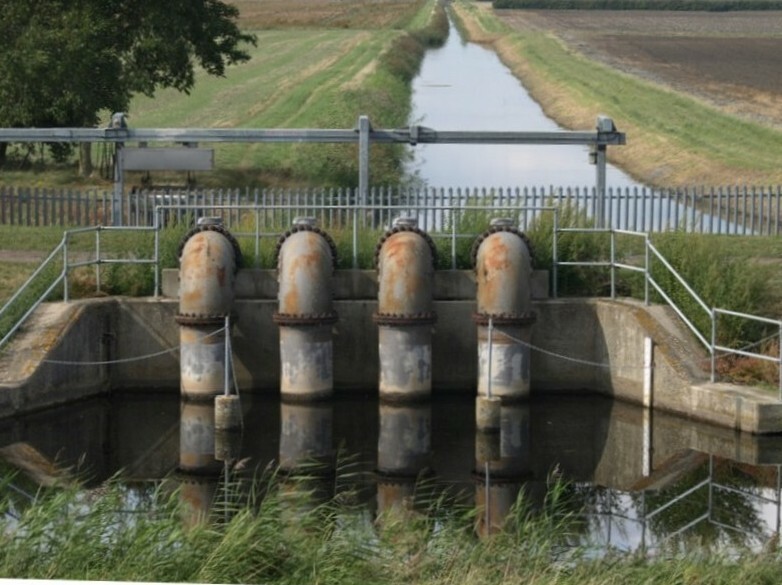 M&WDDC is, in effect, the same as an "Internal Drainage Board" (IDB), and is responsible for draining lands south of the Old Croft River, east of Darcy's Lode, west of the Old Bedford, and north of the Forty Foot drain, discharging into the non-tidal OBR. In 2006, an M&WDDC document stated the area to be 3102 hectares, (7,665 acres) (of which 94% was agricultural); earlier sources quote 8,685 acres, so there must have been some rearrangement of boundaries. M&WDDC are self-governing but receive considerable administrative and enginering assistance from the Middle Level Commissioners (MLC) despite being outside the Middle Level's legal jurisdiction. Understanding the watercourses surrounding or adjacent to the Ouse Washes can be difficult due to the confusing names. My features page explains the overall situation on the rivers section, or go to my CD/OBR page for a more detailed account of this particular river. 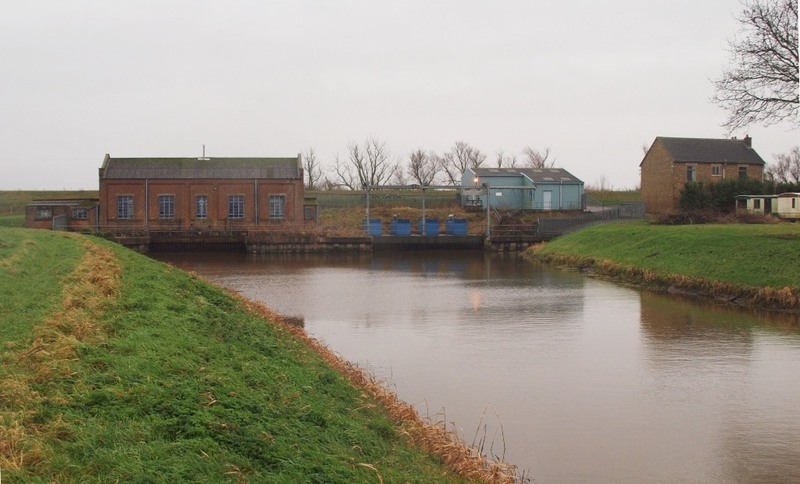 Prior to 1948 the CD/OBR flowed only north-east, discharging into the tidal Great Ouse River via Old Bedford Sluice at Salters Lode. 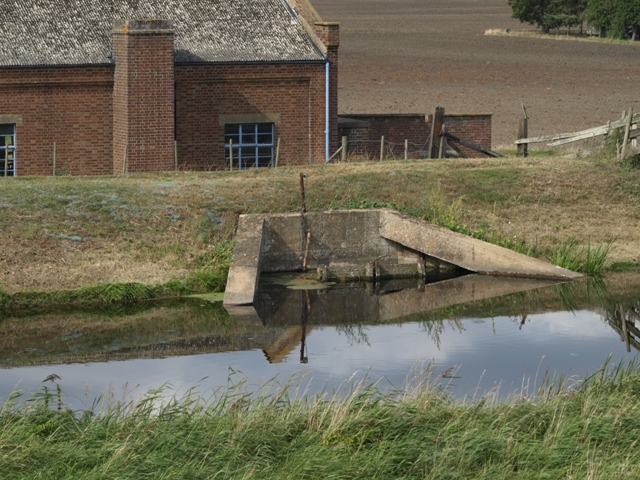 If the sluice couldn't be opened due to tide or siltation, water could flow over a weir (spillway) at Salters Lode into Well Creek, then into the Middle Level Main Drain, eventually discharging into the tidal river at Wiggenhall St.Germans. 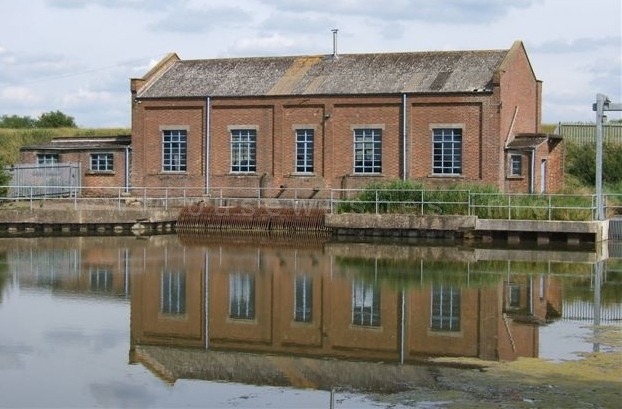 In 1948, following the 1947 floods and because of the difficulties at Salters Lode, a pumping station was built at Welches Dam by the River Great Ouse Catchment Board (RGOCB), then the authority responsible for the "main drains" into which most IDBs in its area discharge. During flood conditions, the new station pumps water out of the CD/OBR into the adjacent River Delph (which can overflow into the Washes if necessary), subsequently discharging into the tidal part of the Ouse known as the Hundred Foot Drain or New Bedford River a mile or so south of Denver Sluice. The suction of the new pumps reverses the flow of the CD/OBR north of Welches Dam and when operating that is where the M&WDDC waters go. Under normal conditions discharge is still via Salters Lode. Bold text indicates equipment still operational. 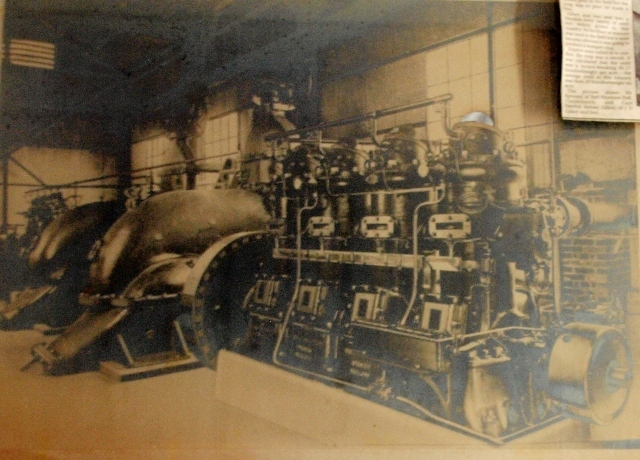 Early diesel engines were known as "oil"engines. 5 Both dates are guesses. Starting based on date M&WDDC formed. End assumes working until steam engine built. 6 From: 'South Witchford Hundred: Coveney with Manea', A History of the County of Cambridge and the Isle of Ely: Volume 4: City of Ely; Ely, N. and S. Witchford and Wisbech Hundreds (2002), pp. 136-40. Even after the pump was built, some sources state that the fens around here were often swampy due to poor drainage. 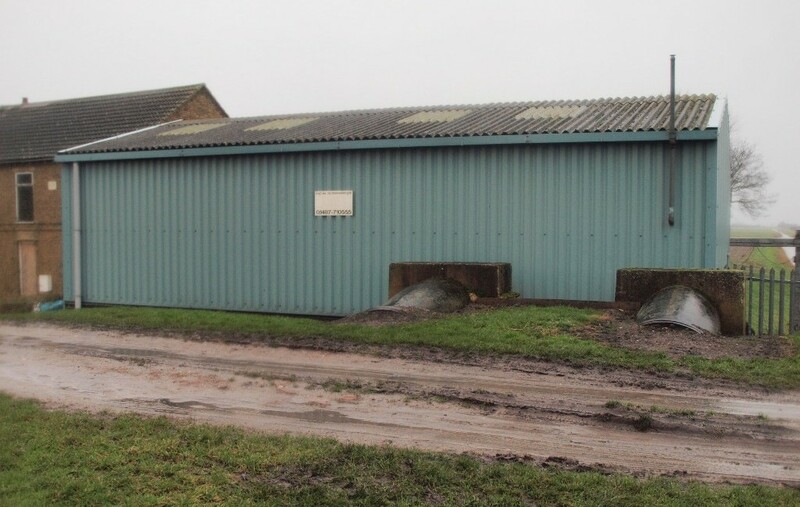 The barrier bank of the OBR (the north-west bank) was also a cause for concern due to occasional overtopping and seepage and frequent remedial works were necessary using gault clay. A great breach of the bank occurred near here in November 1823 according to the History of the County of Cambridge and the Isle of Ely: Volume 4. In 1842 a steam-powered "beam engine" made by Butterley, driving a 32ft diameter scoop wheel rotating three times per minute, was built at a of cost £8,000 to replace the inefficient and by then totally inadequate original wind-powered pump, or "mill". 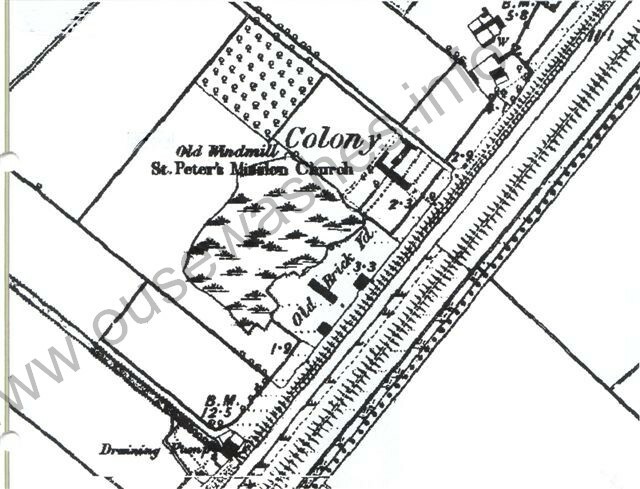 It was the "Drainage Pump" shown near the bottom of this section of an 1890 OS map, just a short distance south-west of the socialist utopian dream experiment, the "Colony", after which the station was named. (See link on navigation menu for full details of the Colony). Bricks for the engine and wheel houses may well have been made at the adjacent brickworks established by the Colonists. Steam was supplied by three "Lancashire" boilers which needed 5 tons of coal a day to fire them at full load. Coal came by river in 50-70 ton loads in one of the many fen barges that were once a familiar sight on the fen rivers and drains. The fuel was manually unloaded and wheel-barrowed over the river bank into a storage area. 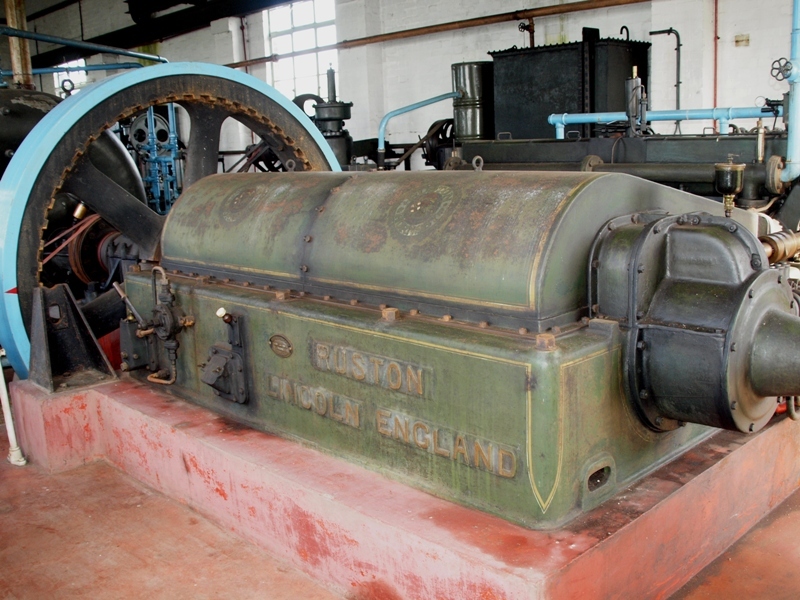 An early authority on pumping engines, Mr RH Clark, said the original plant was demolished before 1914. A much later authority, Mr KSG Hinde, states in his 2006 book "Fenland Pumping Stations" that it was demolished in 1928, based I think on what he interpreted as the date stamped on the outfall pipes of the first diesel plant which replaced steam. 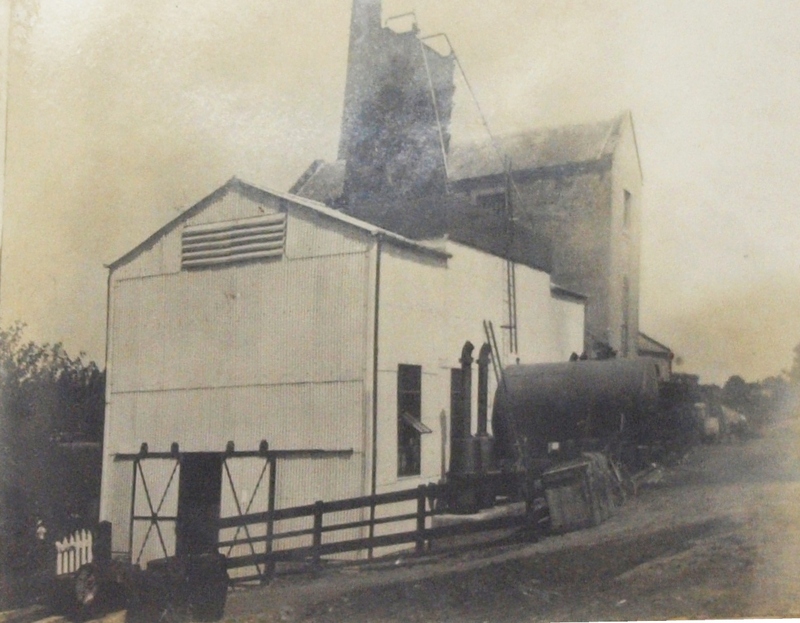 I've not found any remains of the steam plant, but the buildings were still there in 1937, as shown later, despite the statements of the two eminent authorities above. Steam gave way to diesel after some 80-odd years when this station was built just south of the steam buildings, very close to the old wheelhouse as can be seen in these two photos. Clad in white-painted corrugated sheets with a cylindrical tank for the diesel in front and an odd structure above the roof, presumably for engine water cooling. Photo below shows the engines and pumps. Power was supplied by two Vickers-Petter 'oil' (diesel) engines, one at either end of the house, each driving one of the two centrally positioned 36inch Gwynne's centrifugal pumps each capable of discharging 108/120 ? tons of water per minute. Starting these engines was a long job. There were many levers to pull, knobs to turn, and bits to oil, then the heavy fly-wheel (often weighing several tons and here between engine and pump) had to be turned to the starting position manually using a long metal bar over a pivot, locating the end in lugs in the wheel (a procedure known as "barring") and the engine then turned over by compressed air at about 300psi until it fired. (That is common to all large heavy diesels until the advent of light-weight high-speed truck-style engines in the 1960s enabled battery starting.) These engines were however unusual in two respects. They were 2-stroke, and used a "hot-bulb" for initial ignition which was very spectacular due to use of paraffin blow-lamps to blast flames into the top of each cylinder to heat the bulbs. The same building as it was in 1995 when Mr Hinde visited the station but viewed from the opposite (north) end. It was then empty, and was demolished a year or so afterwards to allow construction of the third diesel station in 1997. Note the two discharge pipes in front of the centre of the building, enlarged on right, and still in situ in 2013 in front of the 1997 control room. The pipe remains enables accurate location of the site of the 1923/28? building. Compared with above, the windows have been covered, the tank is at the north end and the top structure (cooling tower) removed. According to this press cutting, ringing of the town crier's bell in Manea on 16th March, 1937, warned of possible flooding and signalled the start of a night-long struggle against the elements. The problem wasn't just here of course, for this was the night of the Great Flood that affected much of the the Fens. Many years later, Mr Gerald Cave, then of Rutland Way, Manea, discovered some old photographs which brought back memories of that dreadful night, and the story and his photographs appeared in a local paper. Mr Cave was one of 50 or so volunteers who rushed to help with sandbagging, later assisted by the Royal Engineers. The report says the river rose close to the front door of the old Colony pumping station which was within inches of being flooded. Sandbags were also needed to protect the Ship pub at Purls Bridge. 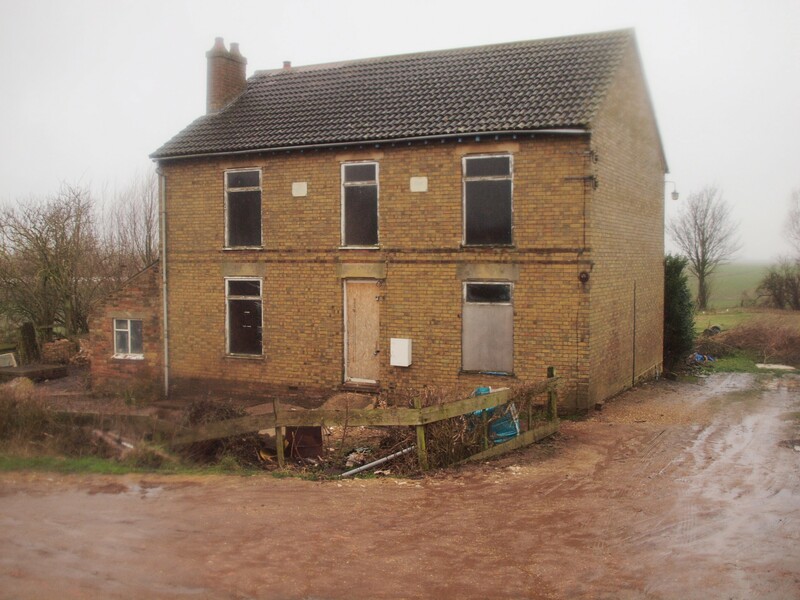 It was said that if the bank of the OBR had breached, floodwater would have reached the town of March. Press cutting courtesy Mrs Peggy Taylor of Welney via Peter Cox. 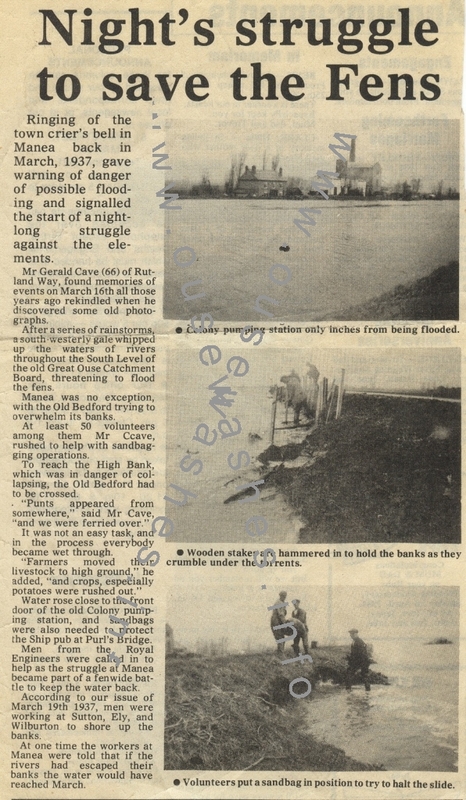 The photo below from the press cutting was taken from the opposite (east) bank of the river during the floods of March 1937, The tall building on the right was the steam engine station house and the chimney is that of the original coal-fired boiler plant. Photo from press cutting courtesy Mrs Peggy Taylor of Welney via Peter Cox. 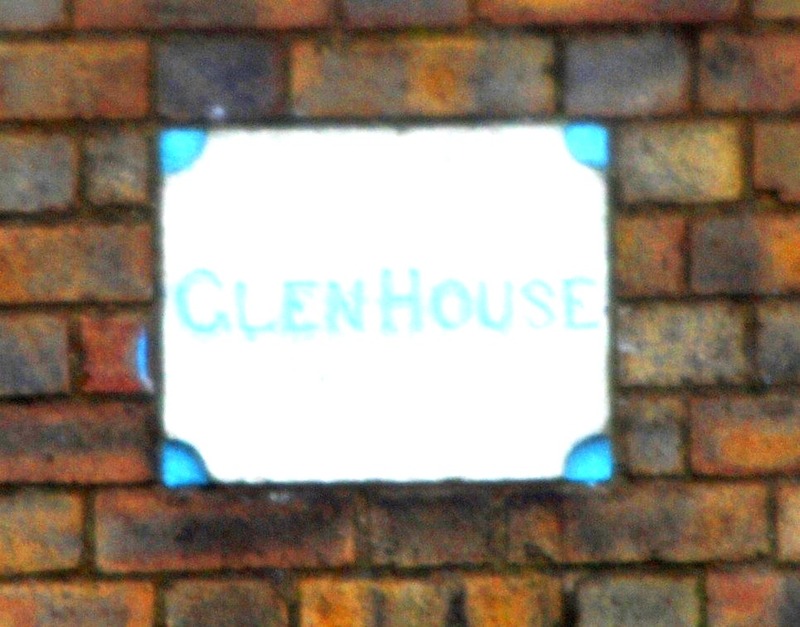 On the extreme left of the photo is a residential property, Glen House (see below), after which the pumping station is now named. 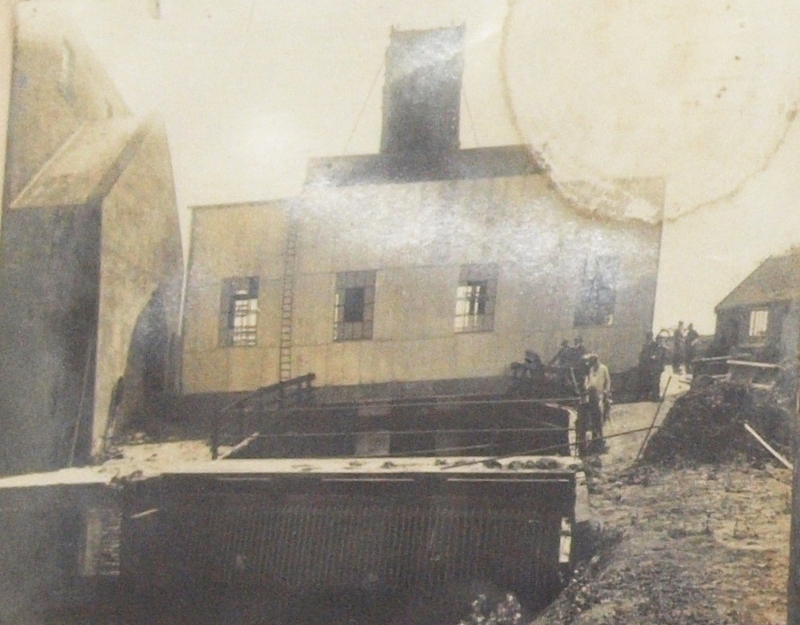 It was built in 1907 as the home of the resident 'engine-driver' (manager/ stoker/ mechanic). It may have replaced an earlier building. 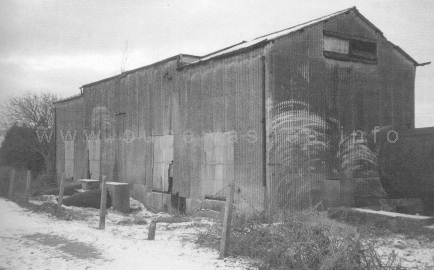 The next change came in 1948 when two huge horizontal diesel engines made by Ruston and Hornsby were installed in a new brick engine house with asbestos cement roof, more-or-less on the site of the steam plant which I guess was demolished to accomodate it. Photo: Eddy Edwards, Jun 2006. Above, the rear, intake side of the 1948 Ruston house seen in 2006 from the Commissioner's Straight Drain. 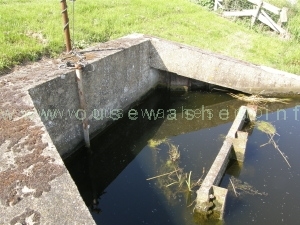 The rusty grill extending into the water is a screen to prevent floating weed and debris entering the pumps. The screen was cleared manually with long-handled rakes. Below is the front, discharge side, also seen in 2006, from the west bank of the OBR. In the distance on the left can be seen the gable end of Glen House. Below is the discharge point on the west bank of the CD/OBR and right seen from the east bank. 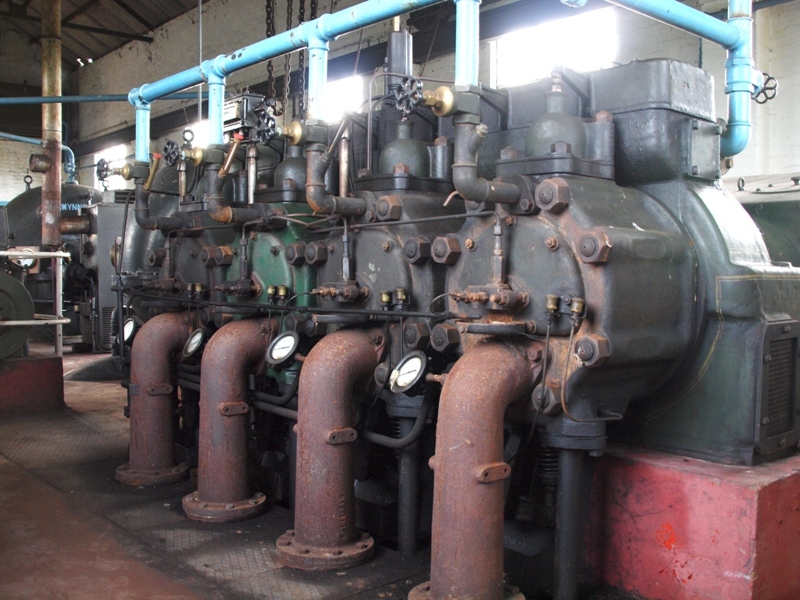 The central vertical rod may have operate a valve that allowed water to be transfered from the CD/OBR to the Board's drain for summer irigation. This station fascinated me for many years before I began my Ouse Washes project and I have been a frequent visitor since 2006. However it wasn't until September 2013 that I was able to see inside the buildings when I was with a small party shown around by Commissioner and local farmer Marc Heading to whom I am indebted. 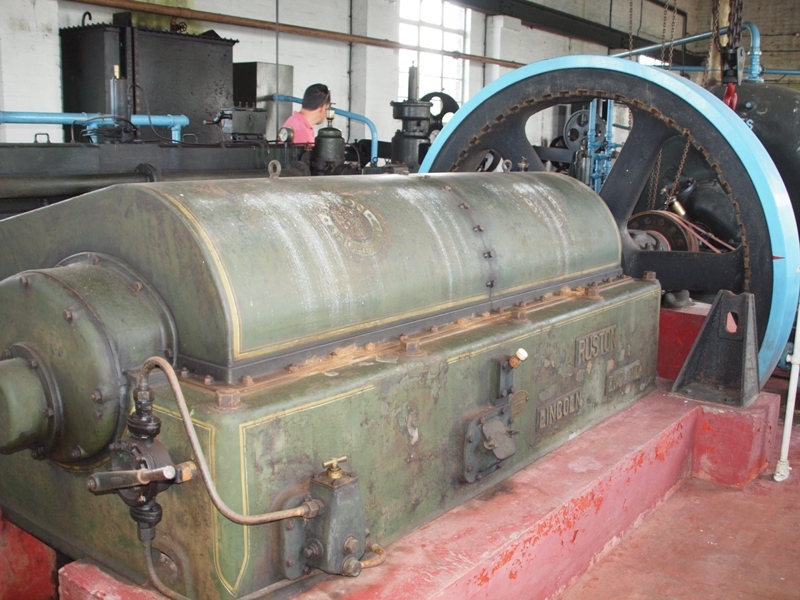 It is a joy for anyone interested in old diesel engines or pumping stations as it is virtually unchanged since it was built. The engines are type 9XHRF, 4 cylinder four-strokes, with 12.5" bores and 22" stroke giving 295bhp driving Gwynnes pumps. It is thought the engines may have been secondhand and previously	fitted in a ship. Starting procedure by barring and air as described in previous section. Oddly, the compressed air receivers (tanks) are dated 1950. Photo: Eddy Edwards, Sep 2013. 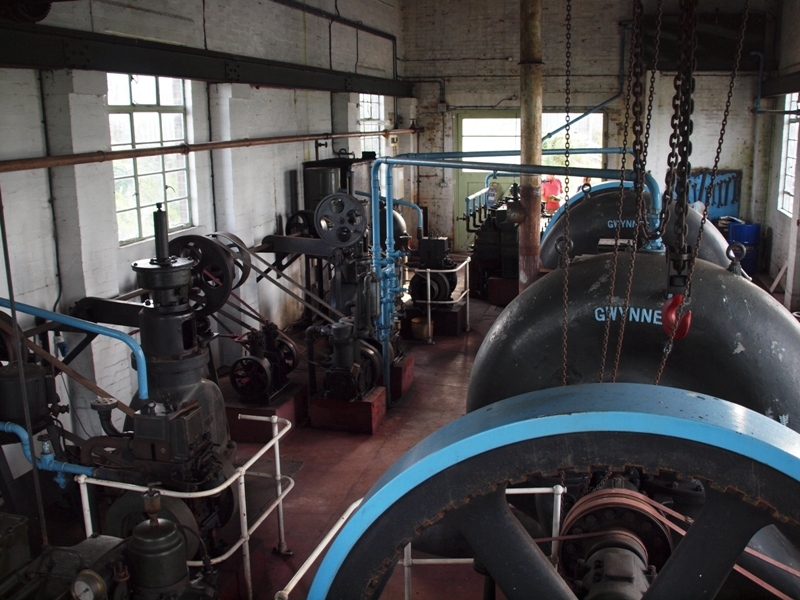 Above, looking south-west in the Ruston House showing the two Gynnes pumps on right and the tops of the corresponding discharge sluice valves on the left. Below are the exhaust and valve-gear ends of the two "flat" Ruston & Hornsby engines and below those the crankshaft ends. On the wall are the black "day tanks" holding diesel fuel. They are topped up from a large bulk tank outside. The Rustons served for nearly 50 years before being put on stand-by in 1998 (not scrapped as stated in Mr KSG Hinde's otherwise excellent book) and were still in-situ together with all the ancillary plant when I visited the site in 2013. 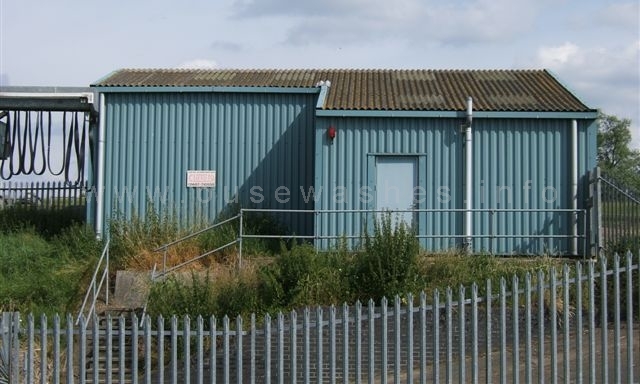 In 1997 a completely new fully-automatic plant was constructed south of the Ruston house, with four Perkins 1006T 6-cyl 6-litre diesel engines each driving a Bedford 600mm pump via a Rossi RV320 right angle gearbox, all controlled from equipment housed in a metal framed, metal clad building. Four new discharge pipes, a new intake point with automatic weedscreen clearance and some re-alignment of the drain completed the works. The engines are not housed; each is contained within a waterproof accoustic cabinet with external top mounted exhaust silencers. I have not seen this arrangement elsewhere. 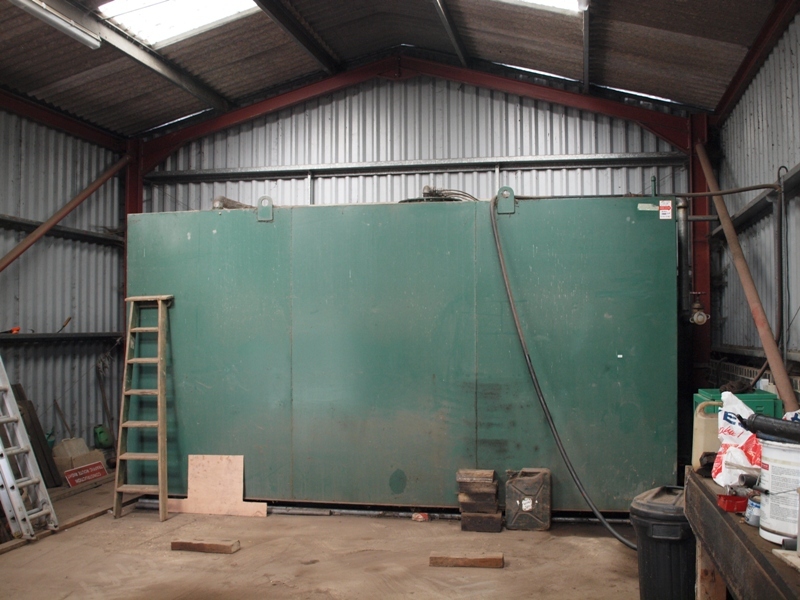 The control house also contains a workshop and oil tank. My assumption is that the old corrugated building seen in the 1937 photo was demolished to make room for this. The metal grill going into the water this side of the engines is a screen to stop weeds and debris being sucked into the pumps. Unlike the 1948 set-up, no manual cleaning with rakes is needed - the overhead beam ("monorail") and suspended grab on the right is an electrically powered screen cleaning device. 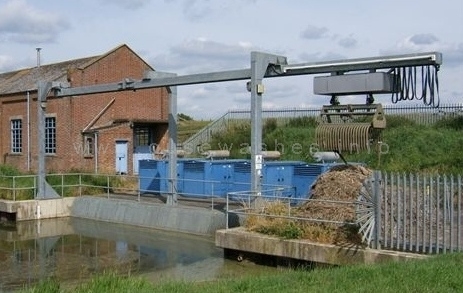 It operates automatically, the grab travelling along the beam, lowering down into the water picking up the muck, then up and over to the dumping area as shown here. At some sites a trailer is placed at the dump point. When I first visited in 2006 the screen-cleaner looked so new I thought it had just been installed. I find the MLC report in 2013 about this a little confusing. It states it was supplied by EJ Lord when the station was built , yet was said to be only 12 years old, which would date it from 2001. The engines and pumps are the beating heart of the station, but the brains are contained in this blue shed. 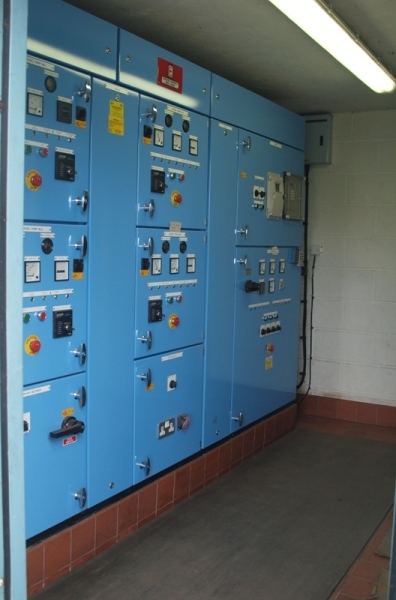 In here is the Carlton Controls electrical equipment that automatically controls the stations operation. 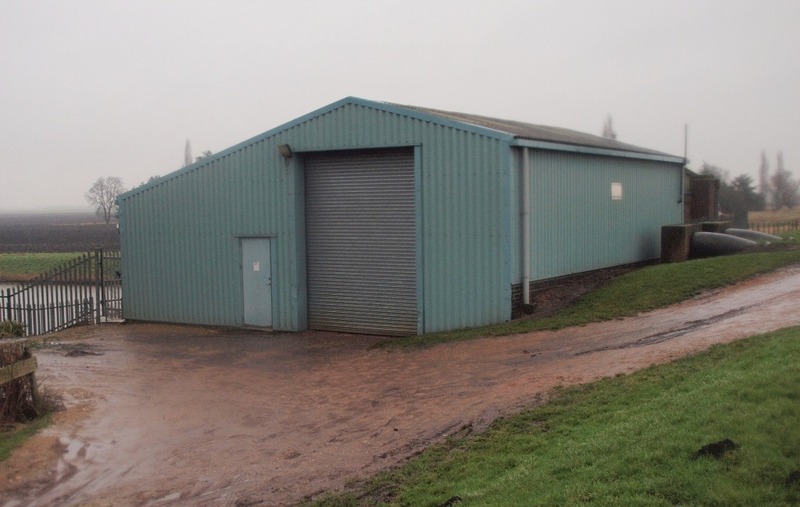 It also holds the bulk fuel tank and plant garage/workshop. Rear view above, front and end views below. The garage and workshop entrance. Below the discharge pipes viewed from the opposite bank of the OBR, and a view along Straight Drain. At the point where it narrows other drains join it from both sides. 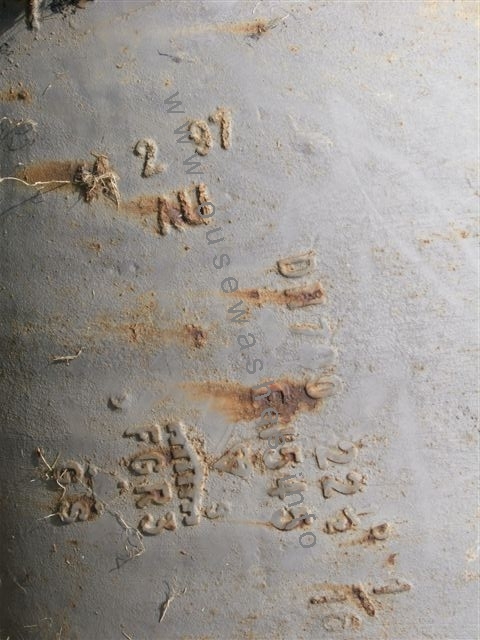 The close up of markings on pipes shows "11 2 97"	- date of manufacture? I've used the term "manager" here and below to cover all the titles used over the years for the person in charge of the pumping works. Originally, the person responsible for the steam engine was known as the "engine driver". That person was probably also in charge of the labour force - stokers, labourers, etc, and would have lived in a tied house near the engine. Managers of the diesel powered stations that followed would also have needed to live on-site until the installation of automated pumps and high-speed truck type engines in 1997. In 1907 the Commissioners built Glen House (below) just south of the steam engine buildings for the engine-driver and his family to live in. As steam engines needed a long time to reach working temperature and constant attention thereafter, it was usual to include a tied house for the operator and his family in the original works, so the house may have replaced an earlier one here. However, there was housing nearby at Colony when the engine was installed which could have been used. Was it just coincidence that the last houses at Colony were vacated/demolished just about the same time as Glen House was built? 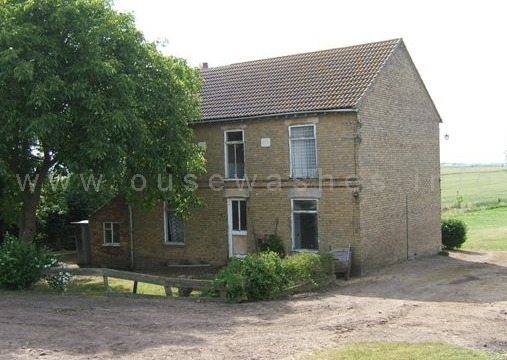 The house in 2006 looking neat and tidy despite being unoccupied for some years. Front left, rear right. The wall stones show name and date built. The flowers right of door stll blossoming a year later. 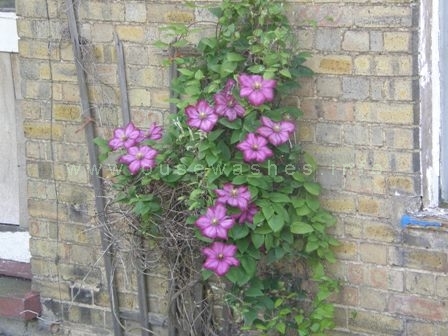 It was sold by the Commissioners on 5th Feb, 2010 for £140,000 but by by 2012 someone's "dream house" project sadly seemed to have turned to a nightmare, the house boarded up and looking derelict, the garden and grounds overgrown. 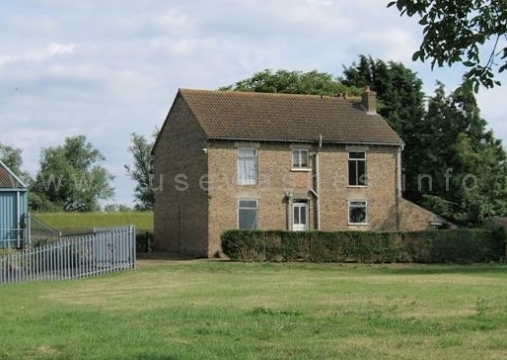 I understand that in 2013 the house was sold again, at some considerable loss.